Susan Hill's The Woman in Black is one of the most renowned ghost stories of all time, gripping readers with it's astounding use of tension and atmosphere to create lingering chills. Having been adapted into a stage play in 1987, which continues running to this day, and a television film in 1989, the story has reached a vast audience; now it's time for the next reworking of the ghostly tale, starring famed Potter actor Daniel Radcliffe. 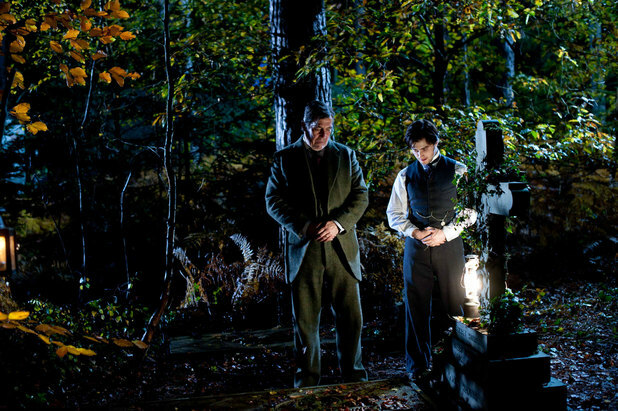 Arthur Kipps (Daniel Radcliffe) is a young lawyer whose wife (Sophie Stuckey) passed away when giving birth to their now four year old son (Misha Handley). Suffering stress and financial issues from his job, Arthur is assigned a final chance by his boss to travel to the market town of Crythin Gifford and retrieve some legal documents from Eel Marsh House, the residence of their deceased client Alice Drablow. Upon arrival Arthur is made thoroughly unwelcome by the paranoid locals and catches sight of a scorned woman dressed in the deepest black; it's not long before he discovers the truth behind The Woman in Black (Liz White), and must race against time to stop her from carrying out her shocking purpose. This Hammer flick takes the original source material and makes a tonnage of changes, some good and others bad. An adaptation of a novel is always bound to have changes to freshen things up, but there are several tweaks to the original story that I was just not fond of. The initial pacing is far too quick, giving little time to develop newly introduced characters and instead shunting them aside several minutes after they appear. It gives little time for atmosphere and tension, making you feel as if the film is far too desperate to get into the main series of hauntings. As time goes on the pacing is more reluctant, making for an experience that gets under your skin with chills and frightening jump scares; it's just a shame it takes a while for the film to calm down. There is depth to this tale, however; it's not entirely an endless barrage of paranormal scares. The explanations are not as intricately handled as they are in other adaptations, making the story harder to fully piece together, but there is a an emotional resonance intertwined with the thrills. During a main series of night time hauntings, things can feel a bit clumsy; as if the film is full of ideas to chill audiences and instead of pacing them carefully to provide the atmosphere, it is just cobbling them all together in a non stop effort to scare. It works, but doesn't feel as intimidating as the astonishing atmosphere achieved in other adaptations, or the novel itself. Daniel Radcliffe provides a good portrayal of our main character, whose personality differs vastly from the novel. It initially feels like the young actor is trying too hard to score the chemistry between Arthur and his child, but it's easy to take him seriously during the horrific moments and the character itself is nicely developed, if a bit dull. Ciaran Hinds portrays the landlord Samuel Dailey just as nicely; he too differs from his novel counterpart, but is an interesting character all the same. As for our eponymous ghoul, Liz White provides a chilling performance that could even give Pauline Moran a run for her money. Enormous praise should be given to the mise en scene and cinematography, however. Spooky yet beautiful sets, perfect costumes, frightening special effects and excellent tense camera shots make for a fantastic visual experience. Whether you enjoy the film or not, it's hard to deny it's absolutely wonderful to look at. Marco Beltrami's fantastic and equally chilling musical score, with added emotional depth, also breathes more life into each scene. 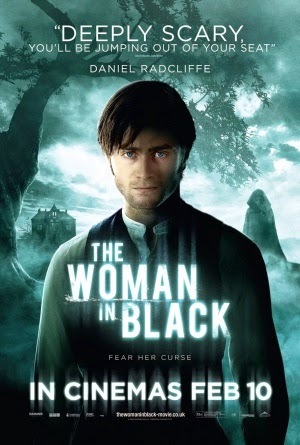 It has it's problems, but The Woman in Black is a film worth watching for fans of the horror/thriller genre. It's very conventional and sometimes clumsy, but those looking for a frightening experience will not be disappointed. It's the least impressive telling of the tale, but as a standalone film, there is much to enjoy.